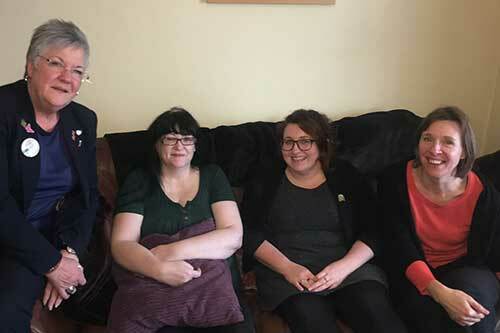 Danielle Rowley MP is encouraging local people to give their time as part of Volunteer Midlothian’s Connect project to help tackle social isolation. Through the Connect project volunteers provide company, practical support and help to connect clients to their wider community. Danielle met with Louise who has an undiagnosed illness that affects her motor skills, making getting out of the house very difficult. Volunteer Maxine visits Louise each week, helping her to attend a digital skills community group. Danielle Rowley MP said: “The Connect project is bringing people like Louise and Maxine together, helping to tackle social isolation and create new friendships. It was wonderful to see what a positive impact the project is having. For further information contact Naomi on 0131 660 1216 or email naomi@volunteermidlothian.org.uk.